ESOL (English for speakers of other languages) test measures your ability to use and understand English at the university level. And it evaluates how well you combine your listening, reading, speaking and writing skills to perform academic and daily tasks. the English language learning tools necessary to effectively function in the competitive business environment of the twenty-first century. affordable. The instructor may monitor each student’s progress from a control workstation. A reporting system maintains each student’s progress. There are four levels of instruction. Basic English Level 1 English is designed for novice learners, who may have no or little experience with the language. Level 1 introduces learners to vocabulary and tasks such as talking about routines to help them develop basic interpersonal communication skills. The vocabulary taught in level 1 comes from the 1,000 most frequent words in English, while the tasks correspond to those needed to move through the ACTFL novice proficiency level. intermediate high proficiency. Tasks in Level 3 assist learners in developing basic interpersonal communication skills, and also include some more cognitively-challenging tasks, such as comparing the features of various objects. Learners are introduced to more words from the 2000 most frequent words in the English language. Basic English Level 2 English is designed to raise learner proficiency from high novice ability to intermediate low ability. Level 2 continues to assist learners in developing basic interpersonal communication skills. Learners are introduced to more of the 1,000 most frequent words in the English language. Tasks in Level 2 correspond to those needed to reach the intermediate low ACTFL proficiency level. Intermediate English Level 4 English is the bridge between basic inter-personal communication skills and the cognitive academic language proficiency that is required in academic and professional settings. Learners begin to build their vocabulary with words from the Academic Word List, a list of words used in a variety of academic and professional situations. Tasks at Level 4 reflect the increasing ability of learners to deal with more complex situations in both speaking and listening. ESOL courses are usually followed by the ECT (English Certification Test). 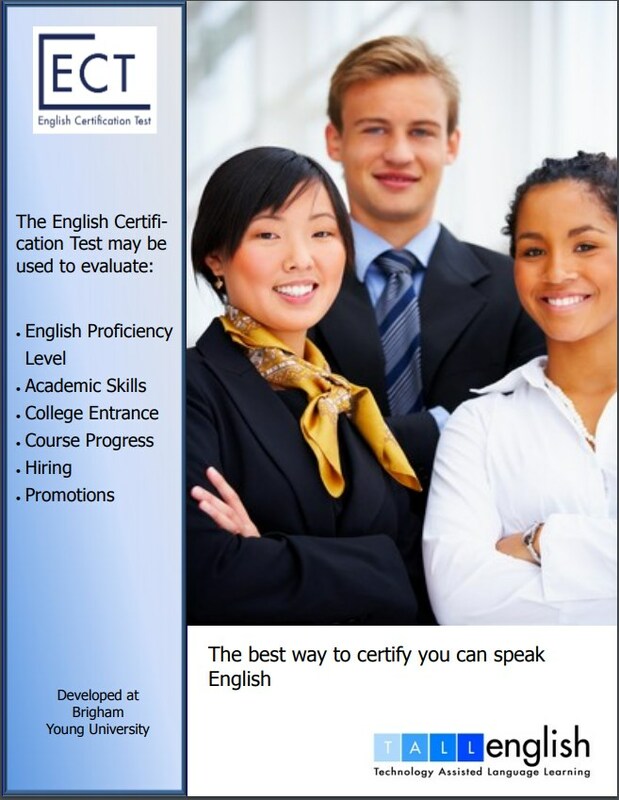 The purpose of the English Certification Test (ECT) is to assess English language abilities. It is given on a computer and tests speaking, listening, reading, and writing. It may be helpful when seeking employment or entrance to a university or prove language proficiency in everyday life. Who Takes the ECT Test? How to register for ECT Test? In order to register for ECT Test, click here. Follow the steps. Where and When Can I Take the ECT Test? Foundation for Advancement of Moldova, 45 Pushkin str. 5th floor, office 505, Chisinau, Republic of Moldova. The fee for exam is 80$. Fees are subject to change without notice.